The newly named Nineteen 16 Restaurant at Waterville Country Club is open to the public as well as the members. Nineteen 16 caters to all needs as it features multiple lounge areas, a dining room and a banquet room. The lounge areas include outdoor seating which is very popular on those long summer nights. 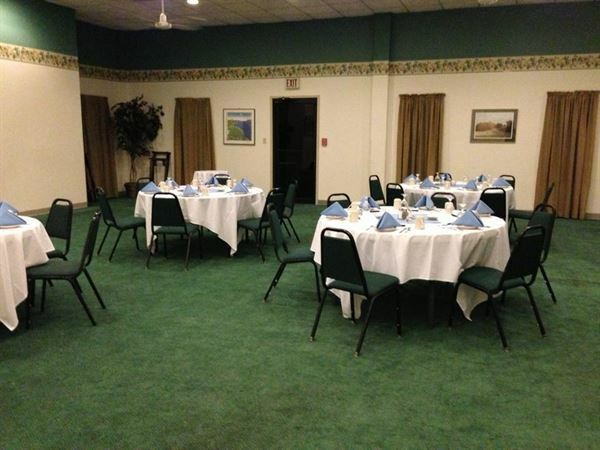 The banquet room is utilized by the club for special events but is also available to be reserved for private functions. The Hilton Garden Inn Auburn Riverwatch hotel in Auburn, Maine overlooks the Androscoggin River with a breathtaking view of the Great Falls and downtown Lewiston. Just minutes from local area festivals and attractions, and featuring 4,500 square feet of divisible conference space, the Hilton Garden Inn Auburn Riverwatch is sure to please those traveling on business or leisure to the Auburn-Lewiston area by providing deluxe accommodations, friendly service and a relaxed atmosphere. Welcome to Hampton Inn Lewiston-Auburn in the heart of Lewiston and Auburn, Maine. Feel at home in a comfortable and spacious guest room, equipped with a clean and fresh Hampton bed®, free WiFi, an ergonomic work desk, microwave, refrigerator and flat-screen TV. If you are traveling with family or planning an extended-stay, choose a suite for more space and amenities. Wake up refreshed to enjoy fresh waffles at Hampton’s free hot breakfast buffet, or pick up a free Hampton’s On the Run Breakfast Bag™, Monday through Friday. Whether you're planning a reunion or special occasion, or searching for space for that all-day business meeting, we have the resources you need to make your next event a success. Maine’s first certified “Environmental Leader” green lodging and conference facility featuring a wind turbine, Maine’s largest solar electric array, solar hot water heating, and four Electric Vehicle charging stations. What started as an elegant farmhouse dating to 1906, Maple Hill Farm is now a full-service conference and event center (along with 8 award-winning bed & breakfast guest rooms) located on acres of country serenity, complete with llamas strolling by the old barn, and chickens producing the freshest eggs. All this is just 4 miles from the Augusta interstate exit or Maine’s capital building and State Museum. Facilities are available to accommodate groups from 2 to 200, and even more seasonally with an attached tent. Custom catering and full bar service are provided in-house. We specialize in business meetings and weddings as well as hosting the traveler looking for a comfortable place to stay in the Augusta Maine area. Ramada Inn Conference Center is a full service, 100% non-smoking facility which recently received the Ramada Pinnacle Award for high levels of Excellence. We offer 15,000 square feet of flexible meeting space centrally located off exit 80 -Maine Turnpike. We have ten meeting rooms to meet any set-up request and can accommodate up to 600 guests for weddings, reunions, corporate functions and other special events. Join us at our on-site restaurant, Fusion, where we serve breakfast and lunch in a casual buffet format. For our evening guests, enjoy a dinner menu that features everything from traditional New England dinners to juicy steaks to Maine lobster, and after dinner, head to Fusion Lounge where you can enjoy live music, dancing and delicious cocktails in an inviting atmosphere.